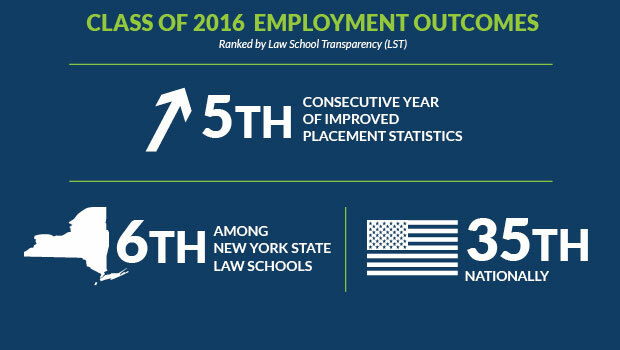 Law School Transparency (LST) has ranked Hofstra Law 35th among all law schools in the nation for its Class of 2016 employment outcomes. The ranking measures employment of graduates who have secured full-time, long-term positions for which bar passage is required — the type of employment most coveted by graduates. Hofstra Law also ranks 6th among New York’s 15 law schools for Class of 2016 employment outcomes using LST’s methodology. This is the fifth consecutive year that Hofstra Law has reported improved employment statistics. This contrasts with the national trend reported by the American Bar Association, which shows that the number of graduates who earned jobs that require bar passage is down 4.1 percent compared with the Class of 2015. The Law School’s employment successes can be attributed to its dedicated Office of Career Services, innovative professional-development programming, and extensive alumni network. Hofstra Law recently launched a 3L Mentorship Program that pairs third-year law students with alumni working in the students’ fields of interest. The goal of the program is to help graduating students be better positioned to secure employment by leveraging the Law School’s supportive alumni. 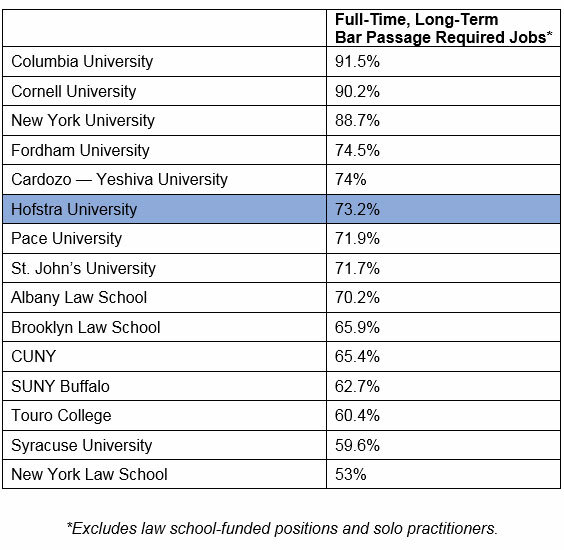 Hofstra Law’s positive job stats extend beyond a graduate’s first legal job. The Law School was ranked 58th in a study that analyzed the relationship between the law school attended and achieving partnership at one of the largest American law firms. Hofstra Law was highlighted as one of the 10 most “under-ranked” law schools when its ranking for alumni partners at “big law” firms is compared with its U.S. News & World Report ranking. View Hofstra Law’s employment statistics for the Class of 2016.